In 2009 they cost 1.2 million to operate. Some police tell Fox59 they're angry at the cuts saying the copters are an important tool in the police toolbox to fight crime. They say Mayor Ballard campaigned policing and community safety was his number one priority. "Yes, it concerns me a lot how are they going to catch the criminal if they don't have helicopters," said Brenda Kent, an eastside resident. "He's actually not living up to what he said," said Janice Hall, an eastside resident. "Sometimes (politicians) say what they have to say, just to get elected." The helicopters were reportedly used to track convicted murderer Brian Reese who shot officer Jason Fishburn and hunt for the two killers in the Hamilton Avenue Murders. "They should find the money for it. They shouldn't cut it," said Hall. Mayor Ballard would not comment directly on the apparent cuts saying he has never wavered in his commitment to public safety and the citizens of Indianapolis. Public Safety director Frank Straub said the helicopters are extremely expensive to operate and there must be clarity about their effectives (sic?). State police maintain four helicopters at an annual operating cost of about 1.4 million dollars. has six, Louisville that has one, Chicago has two. This is the sort of thing that once again reaffirms the Mayor's elitist, out-of-touch agenda. It costs $1.2 million a year to operate the IMPD helicopters. Meanwhile, Mayor Ballard has his former chief of staff and current appointee to the Capital Improvement Board, Paul Okeson, busy negotiating with the Pacers as to how Indianapolis taxpayers will assume $15 million a year in operating costs on Conseco Fieldhouse from the billionaire Simons family, an expenditure that is not even necessitated by the Pacers' contract. Oh, and did I mention that the Pacers would be getting 100% of the revenue off a building we taxpayers would be paying to operate? Mayor Ballard needs to do the Marion County Republican Party a favor and announce he won't run for a second term. Enough is enough. Actually, the copters were flying a pretty restricted schedule even before this. From listening extensively to the scanner traffic, there have been a LOT of times when officers asked whether a copter was available, only to be told it wasn't flying (in one case, I heard them say it would be mover an hour to get airborne). I don't believe both ever were flying simultaneously, but if so then rarely. And I am pretty sure the older one doesn't have FLIR ('night vision'). Paul, I can't necessarily find fault with Ballard making this cut. If the loss of the use of those copters undermines public safety, then we have a real problem. I agree that it makes no sense to be handing out $15 million a year to the billionaire Simons while other city services are being cut. I'd be shocked if helicopters aren't an important law enforcement tool. But I could be wrong...maybe they're not worth it. Certainly though I'd rather have that than give the Pacers $15 million more per year. It still shows where Mayor Ballard's priorities are. What's weird, AI and Paul, is that IMPD actually got an INCREASE in funding from the budget this year. Meaning money to fund the helicopters was moved elsewhere. But where was it moved to? I have a theory. IMPD was refused a grant to fund new police cars of $1.7 million (here: http://indystudent.blogspot.com/2009/11/impd-denied-grant-money-for-new.html). My guess is the city is expecting the money it saves from not using the helicopters + money from unpaid parking fines will cover the lost grant money. This is a moment that should be captured by Daniels and Ballard. Law enforcement and public safety should all act on the same playing field. There are resources to go around if the new Safety Director would walk to 100 N. Senate Ave and visit the third floor and announce a partnership with the Indiana State Police and Supt. Whitesell. 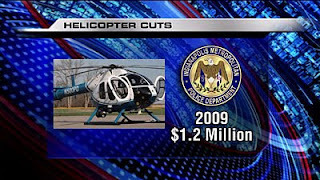 The State Police has helicopters and planes and I would think Governor Daniels would gladly announce with them that he and Mayor Ballard have agreed to pool resources together and use tax dollars to their maximum efficiency. I am sure the State Police can have a way to work with the State Board of Accounts to come up with a fee schedule for the use of the asset with and for the City. Let the Mayor and the Governor figure out way to show the citizens that tax dollars can be placed next to each other for the publics safety together. This is one time Mayor Ballard could do right and find a new set of friends. All policeman and policewomen in Indiana work together day and night. Let their resources work together too. The copters are B.S. resume-padding and make-work projects for a few cops. They're unnecessary and quite sinister. Will someone please conduct an economic analysis of the affect of police on crime? I fully believe that police will be shown to be more expensive than the criminal activity they claim to prevent. Further, I doubt that it can be proven that police prevent any crime, at all. Maybe the police helicopters are the "fluff" that Ballard promised to cut as a campaign promise to save money? These cuts have to be made. The City will lose about $30 million a year in reimbursements from the state due to declining revenues. There simply will not be sufficient revenues in the current budget to pay all funded items in the budget. We know that. I went to some of the budget hearings myself. But I'm sure you share in my frustration that the folks on the 25th floor aren't being honest to us. If they had put this in the budget, then we'd handle it because these are tough economic times. Or they'd use part of that $15 million rainy day fund to cover this. But instead, they ignore it, hide it away, and treat us like children by acting as if it's some surprise. If you remember correctly the City bought a New Helicopter under the Peterson Administration. An MD 500 or MD 600 I forget the model number. Why isn't that being sold, to keep the Bell or Jet Ranger in the air? This is a true tool to law enforcement. Lost children, elderly, people with disabilities are easier found when a department can use the air to look from. Not to mention the amount of innocent people that are hurt during a chase, which someone being in the Air can give updates on changing traffic conditions, and also allow the officer to back off. A tool that is used during major events such as IBE, CCC, and the races. With the Superbowl coming in two years if things are not changed I do not know how a lot of the things the air unit did that will not be done. It is sad a "World Class City" such as Indianapolis is not able to keep the Air Unit, and thus placing all of us in danger.